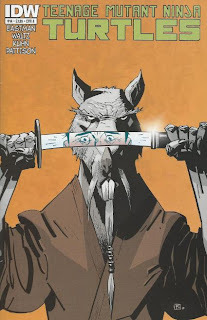 "Sins of the Fathers, Part 2"
At the Jones house, Splinter holds Casey’s dad hostage with a sai at his throat, asking if Raph thinks murdering him to be the right thing to do. Raph concedes that killing Jones wouldn’t solve anything and admits that he nearly gave into his inner anger. Splinter reveals that in his youth, he also struggled with similar demons and that it was the love of his family that brought him peace. 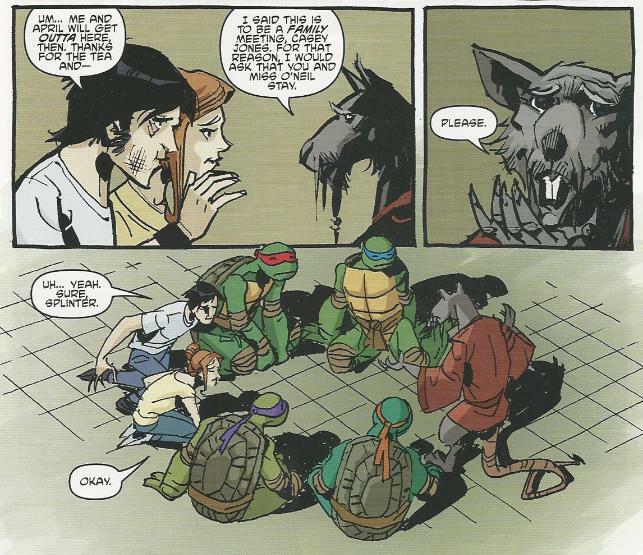 Raph asks what they can do about Mr. Jones so that they can help Casey and Splinter says he has an idea. On Burnow Island, General Krang is giving Baxter Stockman a tour of the facility. He brings him to a room full of stasis tubes, each containing a brain-creature similar to himself. Krang explains that he is an Utrom from the planet Utrominon in Dimension X. Krang then escorts Stockman to the dimensional portal room, where many humans and Stone Soldiers scramble about, working on projects. Stockman is somewhat incredulous and so Krang details his history. Long ago, Utrominon was a powerful world and his father, a warlord named Quanin, conquered many planets (with Krang as his second-in-command). Unfortunately, Quanin’s success made him many enemies and Utrominon was eventually attacked by fleets of ships. The world was destroyed in the battle and the only surviving Utroms now dwell in the stasis tubes on Burnow Island. Suddenly, Krang’s story is interrupted by a pair of Neutrino rebels who forcibly burst through the portal, guns blazing. 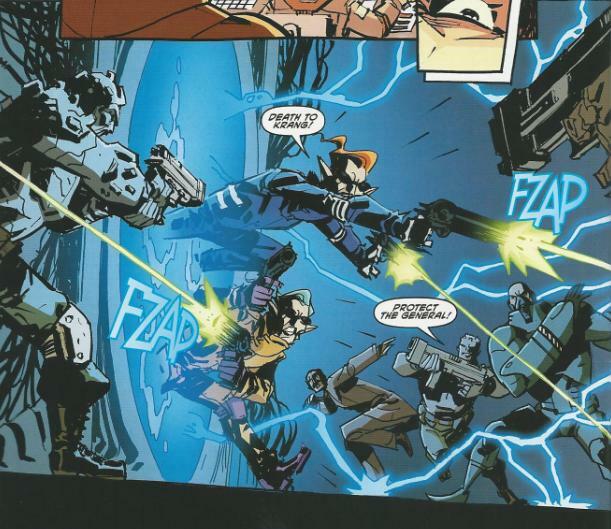 Captain Tragg and the Stone Soldiers fail to quell the sneak attack, leaving Krang to eliminate the rebels with the gauntlet lasers of his robot body. Krang hurls the Neutrino corpses through the portal and delivers a series of commands: Captain Tragg is to make sure that Pogue and his technicians make the portal more secure and Lieutenant Granitor is to double the guards at the portal entrance on the Dimension X end. Baxter, recovering from all the fireworks, is curious as to Krang’s point in giving him such a friendly tour. Krang tells him that the only reason he hasn’t been executed for failing in his genetic experimentations is because his Mousers have proven him to be skilled with robots. He then ushers Stockman to a construction zone to introduce him to his next project: The completion of the Technodrome! At the Second Time Around shop, the Turtles and April help Casey to recover from his beating. Casey realizes that he was wrong not to go to his friends for help before, but having spent so much of his life alone, he finds that asking others for help doesn’t come easy. At the Jones house, Splinter tells Raph to collect Casey’s things, as Casey will be moving in with them. Returning to the shop, Splinter asks that the whole family (including April and Casey) gather around for a serious talk. 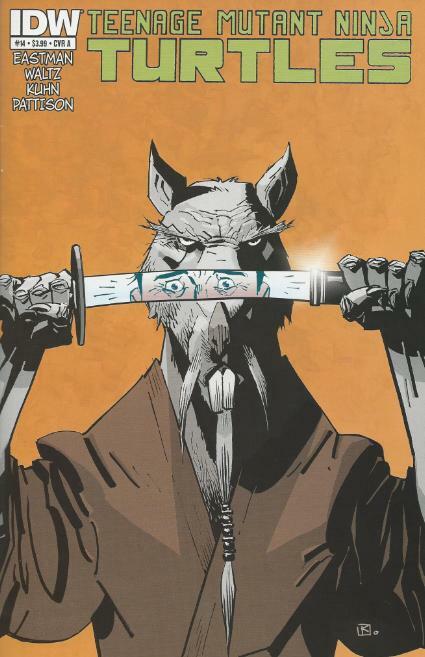 Splinter reinforces his teachings about non-violent solutions and that killing should be avoided whenever possible. However, he explains, the Shredder is a far different foe and must be dealt with more drastically. He regretfully tells his sons that they may have to break their code against killing in order to end the Shredder’s reign of terror for good. At Foot HQ, the Shredder explains his intentions to Karai. He says that before he had Hamato Yoshi and his sons executed, he spied on the family for days. He saw great potential in Yoshi’s eldest (now Leonardo) and believes that he still retains that warrior spirit. After observing him in the present, Shredder concludes that Leonardo is the only one worthy to be his heir. *This story is continued from TMNT (IDW) #13. The story continues in TMNT Micro-Series #7: April. *The events of TMNT Annual 2012 occur between this and next issue. *Splinter (as Hamato Yoshi) was shown battling with his anger in TMNT Micro-Series #5: Splinter. *This issue marks the first time ever that the Utrom Homeworld has been given a proper name: Utrominon. *Despite the similarity in likenesses, the Neutrinos killed by Krang are not the same as the Neutrinos who show up later in TMNT (IDW) #17. *The Shredder, in disguise, tested Leonardo’s skill to determine his worth in TMNT Microseries #4: Leonardo. *This issue was originally published with 3 variant covers: Cover A by Kuhn, Cover B by Eastman and Pattison, and Cover RI by Ramon Perez and Ian Herring. Many revelations punctuate this issue, as IDW’s TMNT comic kicks into high gear (even more so if you read the Fugitoid microseries after this issue, as it was intended to be published). In regards to the Foot Clan subplot and it’s forward momentum, I find it very gratifying to see all the seeds planted by Waltz and Burnham in the first year coming to fruition. I had thought that the Shredder’s convoluted scheme to disguise himself as a normal Foot Soldier and test the Turtles seemed rather random, but now we know his true purpose: To see if Leonardo was worthy of being his heir. There’s a lot of “thinking ahead” in this title, which is what I like to see. It’s great having a book with a dedicated architect plotting years in advance as opposed to authors who work in trade-friendly “arcs” and then pack their things after six issues are up. The Jones section of the book, and by extension the portion focusing on the Turtles, was perhaps the least interesting plot line, but it gives the TMNT-themselves a breather from all the action and I like to see that, sometimes. Casey coming to live with them is a pretty cool idea, as I always liked his dynamic in the Mirage comic when he and the Turtles shared the farm in Northampton. The lengthy speech about “family” got a bit saccharine after a fashion, but it’s important to drive the point home that Casey has friends looking out for him. The guy’s kind of thick, so he probably needed the three pages of dialogue to get it through his head. And, of course, there’s everything with Krang and Dimension X and the Neutrinos and the Technodrome and man, I’m flipping out. While the early publication of the Fugitoid microseries somewhat undercut the dramatic reveal of the Technodrome (it was mentioned so off-handedly in the Fugitoid issue, I had a suspicion we weren’t meant to know about it yet), that doesn’t make its return any less awesome. While keeping the “golf ball” look might be questionable, I still can’t wait to see it in action. And hopefully it doesn’t get waylaid five minutes after it powers up like at the end of every season of the Fred Wolf cartoon. I don’t have anything new to say about Kuhn’s art that I didn’t get off my chest in the previous review. It’s strong for all the same reasons and it stumbles for all the same reasons. As the Turtles aren’t in this issue’s spotlight, you get more page-time devoted to Kuhn’s strengths and that makes this a better-looking issue than his more Turtle-centric efforts. His layouts are great and, if he does his own inking, his use of heavy shadow in the Krang portions of the issue are superb. The Neutrinos also look so positively ridiculous as they make their dramatic bid to assassinate Krang, I absolutely loved it. If you love-hate the Neutrinos as much as I do, then you’ll find those pages pretty hilarious (in large part to Kuhn’s art). 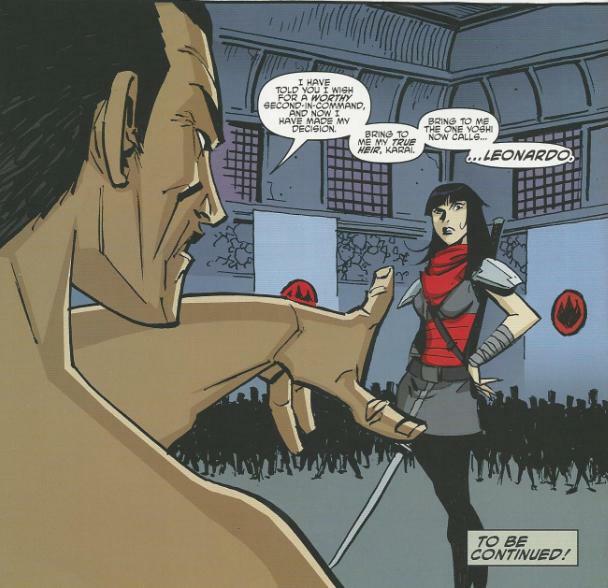 And it should be mentioned that he totally nailed Karai’s expression on that last page. I don't think Zak and Dask biting the big one in this issue was just a christmas gift for you. I think it was just the thing, that all of us who were worried the first time we read the word Neutrino in the IDW series, needed in order to set our mind at ease about what their role would be. Unfortunately, that moment with them was the only really stand out moment in this month's issue for me.